Today I want to focus on one of my favorite root vegetables. I’m pretty sure the parsnip is under-loved because most grocery store ones are bland and possibly bitter. If you are not a parsnip lover, I’d recommend either trying one from the farmers market after a few frosts have come, or spring dug parsnips (my personal favorite). Most root crops are better after a frost since they start converting their starches to sugar. 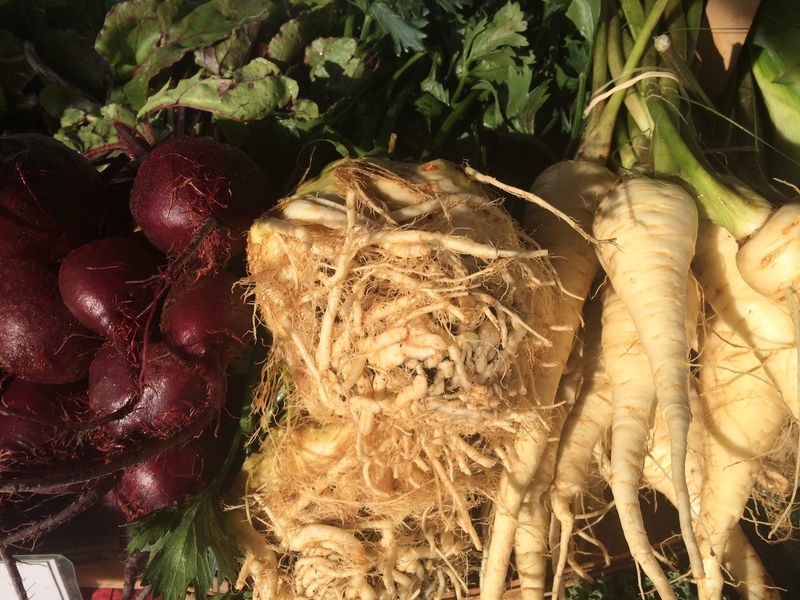 My favorite root chops…parsnips are on the right. Parsnips are related to carrots, celeriac, and parsley root but have more of a complex, herbaceous flavor. Sometimes I think they are a bit earthy and sweet tasting. While they are edible raw they are usually cooked since they are quiet dense. While you don’t need to peel parsnips I generally like to since sometimes I find the peels a bit bitter. Parsnips are native to the Mediterranean region and are generally higher in sugar than carrots. They are actually comparable in sugar to banana’s and grapes (it’s the good kind of sugar though!). Parsnips are rich in soluble and insoluble fiber, and contain same anti-oxidants that carrots have. They are also high in vitamin C, k and, E, and folic acid. It also has good levels of minerals like iron, calcium, copper, potassium, manganese and phosphorus. My favorite way to eat parsnips is slow roasted in a 300F oven, peeled, cut into smaller chunks, and tossed with olive oil and salt. It may take an hour or more but it’s worth the wait! This entry was posted in About produce, Farm News, Uncategorized. Bookmark the permalink.